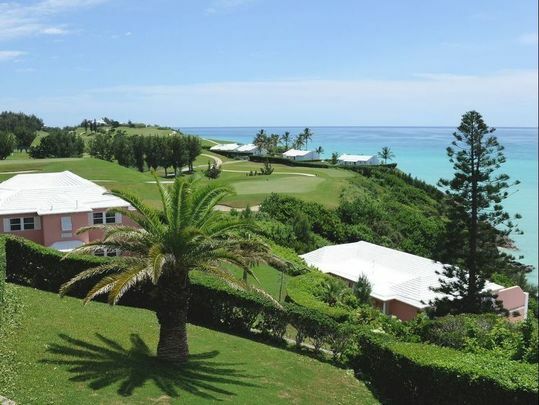 2020 Bermuda Golf Cruise – exclusive GolfAhoy offer! With OLife Choice a limited-time early birdie booking inclusive package enjoy 2for1 Cruise Fare, Free Roundtrip Air, Free House Select Beverage Package Champagne, Wine, Beer with lunch & dinner, and Free Internet. Book & Deposit $1500 by August 01, 2019. GolfAhoy Bermuda Golf Shore Excursions package additional. Upgrade to Prestige Unlimited Beverage Package and enjoy unlimited premium spirits, Champagne, wine and beer wherever and whenever you wish 24/7 – upgrade $20 per passenger per day. This 2020 GolfAhoy Bermuda Golf Cruise can be bought as a 7 Day – or a 10 Day VIP Deluxe GolfAhoy Golf Cruise with a 3-night pre-cruise stay at the AAA 4-Diamond Grand Cascades Lodge at Crystal Springs Golf Resort – just 47 miles from New York City – unlimited ‘Albatross’ golf package included – 6 Championship courses to choose from! More info below. Oceania Cruises OLife Cruise Fares 2for1 including FREE Airfare from select North American gateways. Custom Air deviation fee $175 for passengers doing 3-night pre-cruise Crystal Springs Golf Resort ‘hotel & golf’ add-on package. 1, 2 or 3-night pre-cruise or post-cruise Mid Town Manhatten Lotte New York Palace hotel from $549 per passenger per night, airport and ship transfers included. Tampa Toronto Vancouver Washington, D.C.
Come and go as you please. Oceania is elegance without pretense nor the need for tuxedos and evening gowns. This is a world where you can be yourself. The overwhelming sense of comfort and belonging seems to kindle geniality. The cuisine is renowned as the finest at sea. Oceania Cruises’ commitment to culinary excellence shines from beginning to end. The most highly awarded cruise line gourmet culinary program begins with sourcing premium artisanal ingredients. Of course, the distinguished chefs, selected from the world’s best restaurants, are the true masters behind the magic of Oceania Cruises’ cuisine. With 400 gracious staff to serve only 684 privileged guests, the level of personalized service is always simply sublime. Upgrade to a Concierge Level Veranda Stateroom or a Suite for a combination of luxury, privilege, and value, ask your GolfAhoy golf cruise counselor for details on Concierge exclusive privileges. 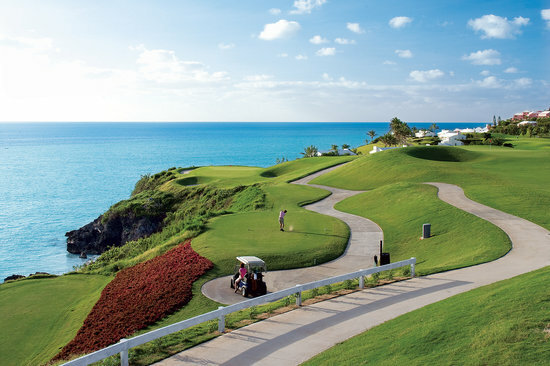 Bermuda has the most golf courses per acreage in the world on its 22 square miles of land. Set in a lush garden estate with commanding views over the great sound, Belmont’s Emmitt Devereaux-designed championship standard par 70 course with a total yardage of less than 6,000 makes for an enchanting round of golf. 18 Holes – Par 70 – 5,769 yards. Situated in Warwick there is no 10th-century castle here, that one is in England. The course includes fast multi-tiered greens, tight fairways, and plenty of strategic bunkering. On the back nine, there is a million-gallon lake that provides challenging water hazards. Design changes in 2002 made it more exciting with a layout that favors accuracy over strength. The course offers scenic views of Hamilton Harbor and the Great Sound used by Pirates past! Located on the grounds of the luxurious resort, this 18-hole par three course was designed by Theodore G. Robinson. The average playing time for this 2,684-yard course is two hours with every iron in the bag being called in to play over a hilly, panoramic layout. The course features 18 challenging par three holes. Whether tournament play or just a friendly game takes you out on the course, you will be delighted with the myriad of bunkers, two water hazards, and three tee offerings. 18 Holes – Par 54 – 2,684 yards. Centrally located, the Horizons Golf Course offers the only Mashie Course on the island. With nine holes played two ways to give a full 18-hole golf course, Horizons is a unique venue to enjoy a game of golf. Built in 1921, Mid Ocean was originally designed by Charles Blair Macdonald and then modified by Robert Trent Jones in the 1950s. This 6,512-yard course is set in the blue water of the Atlantic. Classic test good shots are rewarded; bad shots are penalized. Mid Ocean Club plays 6,549 yards over a piece of Bermuda that tosses and turns more than an unmade bed. It is one of C.B. Macdonald’s most important designs which defined island golf architecture when it opened in 1921 and continue to today. The first three holes play along the Atlantic but for the most part, the ocean doesn’t get in your way. No. 5 is a thrill; a 435-yard par four that tees off 90 feet above Mangrove Lake on a line of your choosing to cut off more or less of the hazard. This is when you take a wider stance, make a big slow turn and launch! Robert Trent Jones did a touch up in 1953 primarily adding length. Between 2003 and 2005, Tom Doak oversaw further modifications including a conversion of the greens to TifEagle. Mid Ocean also gets high marks for offering one of the grandest views in the game from a halfway house! This superbly challenging course has proven to be as competitive as it is picturesque. The elevated, central location offers wide North Shore vistas. With 18 tee positions, you will want to add a second nine to your conquest of the first. NOTE: Ocean View is a government-run, public golf course. 9 Holes – Par 35 – 2,940 yards. 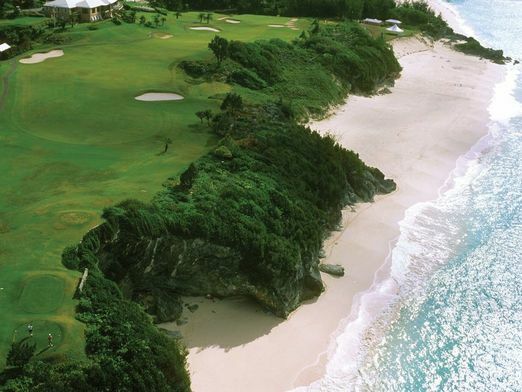 Robert Trent Jones has taken full advantage of some of Bermuda’s most stunning South Shore terrain in laying out this popular and demanding course. The cliff-side holes are especially memorable. Port Royal Golf Course is on the west extreme of Bermuda. Designed by world-renowned architect Robert Trent Jones Sr. in 1970, Port Royal has recently undergone a complete, $14.5 million renovation led by original design team member Roger Rulewich for the PGA Grand Slam of Golf. A club that has always found itself ranked among the best public courses you can play, now has TifEagle covering its vast, undulating greens plus a computerized irrigation system to complement stunning views of the ocean and the island. Both signature holes are par threes. On the front nine of this 6,842-yard gem of a golf course, its No. 8 playing 213 yards straight into the ocean to an elevated green that slopes away from the tee. On the back its No. 16. This is one of the all-time best in the game; a 235-yard par three that presents two choices: the green or the ocean. Distinctly Bermudian in style and character, with an uncompromising emphasis on privacy and luxury, Tucker’s Point Club rivals the finest resort communities in the world. Golfers traverse undulating fairways with many elevated tees while coping with the varying speed and direction of changeable winds. Many holes and greens boast dramatic water and overland views, and scenic opportunity at every turn. Golf courses subject to change/substitution in the event of tournament play. Crystal Springs Golf Resort 45 Miles from Manhatten. 3 Night pre-cruise add-on option at Crystal Springs Golf Resort 45 minutes from Manhatten. Crystal Springs Golf Resort is a spectacular NJ vacation destination with six Championship golf courses, acclaimed as the New York Metro area’s most unique four-season resort. Located in the rolling farmland of the Garden State’s picturesque northwest, this world-class New Jersey resort is just an hour from New York City. Crystal Springs Golf Resort is the premier world-class golf destination in the Northeast with six championship caliber courses within a five-mile radius. Set among the Appalachian Trail through the Kittatinny range in beautiful northwestern New Jersey, the Resort has recruited the world’s best golf course architects, von Hagge, Trent Jones, George Fazio, and Rulewich, to create an amazing collection of golf courses. 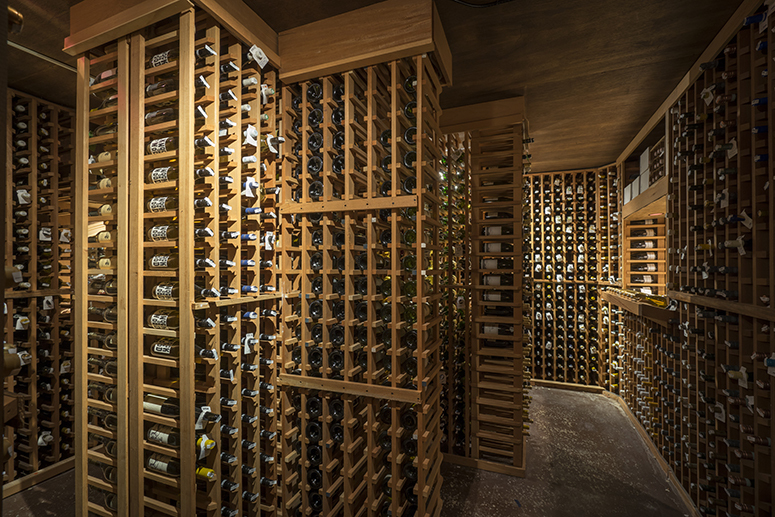 Crystal Springs Golf Resort Wine Cellar. The award-winning Ballyowen Golf Club was designed by Roger Rulewich, the longtime lead design associate for Hall of Fame designer Robert Trent Jones Sr. – Rulewich applied all of the design knowledge he acquired from Trent Jones Sr. to create a modern day classic with links-style features that are spread out over 250 acres atop a plateau, and highlighted by 360-degree views overlooking the spirited Wallkill River. Ballyowen’s fescue lined golf holes meander through open meadows and rolling farmland creating a feel of an inland Heathland-style course of Ireland. 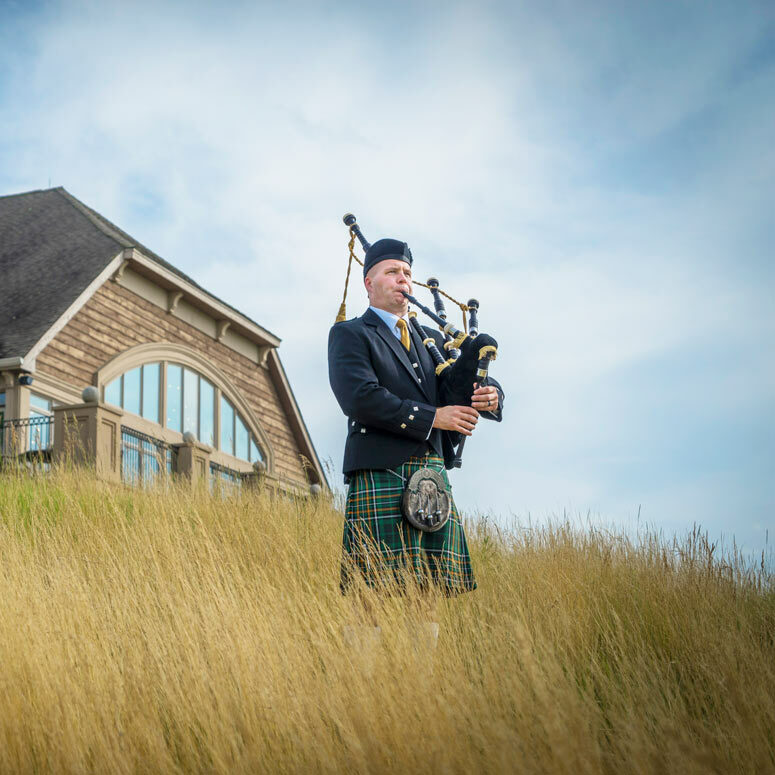 The Celtic atmosphere transitions over to the clubhouse’s Owen’s Pub, where golfers are entertained by the serenade of the bagpiper every evening. Ballyowen is proud to be the only public golf course in NJ offering caddie service. For just $20 extra, you can experience Ballyowen the way it was meant to be played. Created to satisfy golfers of every skill level and rated “very good to excellent” by Zagat, Black Bear is a recreational golfer’s paradise. Black Bear opened in July of 1996 and has enjoyed tremendous popularity ever since. Boasting a 6,673-yard layout co-designed by famed developer Jack Kurlander, Black Bear offers you an inviting diversity of terrain, scenery, and shot selections. Black Bear is a recreational golfer’s paradise. The Cascades is the newest course which expands the offering to 90 epic holes. Nationally renowned golf course architect Roger Rulewich of The Golf Group, Inc., was at the helm of the new course’s design – his third at Crystal Springs Resort, including Wild Turkey and Ballyowen Golf Clubs. Measuring 3,627 yards, the course’s design stresses playability and features junior tees to make the course more enjoyable for those new to the game. Crystal Springs Golf Club is recognized as one of the finest golf facilities in the northeastern United States. When Crystal Springs opened in 1992, it was rated among the top 25 new golf courses in America by Golf Digest Magazine. The Jersey Golfer named Crystal Springs “The Best Public Golf Course” in New Jersey in its ranking of the state’s best layouts. Year after year, Crystal Springs ranks among Golf Digest’s top 10 list for golf courses in New Jersey. Crystal Springs is also considered the most challenging layout in New Jersey. Despite measuring just over 6,800 yards from the championship tees, the distinct character of the club can be attributed to designer Robert von Hagge of Houston, Texas. Von Hagge has long been recognized as one of the leading golf course architects in the United States. One of the hallmarks of a von Hagge course is sculpted mounds that frame the fairways and greens giving definition to each hole while adding an intense contrast of color between the fairways and roughs. When the limestone quarrying operations ceased in 1929, the site filled with water, forming the many natural springs that now dot the property. The clear waters at the 11th hole prompted the naming of the community, the golf course, and, ultimately, the Crystal Springs Resort. With its debut on July 7, 2001, Wild Turkey became the Crystal Spring Resort’s second Roger Rulewich design – an outstanding encore to Rulewich’s award-winning Ballyowen. Located adjacent to Crystal Springs Golf Club, Wild Turkey’s topography is best described as “basin & ridge”. The layout’s two distinct terrain types combine the sheer expansiveness of Ballyowen with the rugged, multi-elevated nature of Crystal Springs. While it may be easy to classify Wild Turkey as a combination of its two sister courses, Wild Turkey stands on its own merit as a uniquely designed golf course. The basin area of Wild Turkey consisting of holes #3 and #12 through #17 — is reminiscent of the treeless expanse of Ballyowen. The par-3, 14th tee affords golfers a view of the entire hollow, while challenging them with a long iron to a deep green. Many of the par-4’s feature limited aprons require both strategy and precision on the approach shot. The green surrounding for the picturesque #15th hole is indicative of this prevailing design concept. The par-3, 7th signature hole at Wild Turkey shares much in common with Crystal Springs’ signature hole. It, too, is a forced carry over a quarry lake to a well-protected and intimidating target. Comparable again to Crystal Springs and Ballyowen, playing Wild Turkey is considered a challenging event. Yet the multiple tee locations, generously wide fairways, and moderately contoured greens make Wild Turkey an enjoyable experience for all skill levels.